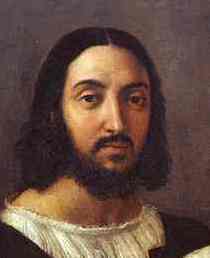 Raffaello Santi (or Sanzio) (1483-1520), known as Raphael, was born in Urbino, Italy. He mastered the use of color and painted beautiful frescoes in churches and for private patrons, the most famous of which may be The School of Athens (1509), an interesting painting depicting Plato and Aristotle surrounded by their pupils. He was inspired by two of the greatest artists in the history of the world: Michelangelo and Leonardo da Vinci. Both of whom were in Florence during the time that Raphael was working in the studio of Perugino. Soon he began to adopt Michelangelo's vigorous energy and Leonardo's sfumato and spiritualism. Raphael lived an active life. The numerous architectural and painting commissions he received caused him to overwork. He died at the age of thirty-seven. ↑ Raffaelo Sanzio Painters BIOGRAPHIES. This page was last modified on 11 July 2016, at 19:37. This page has been accessed 17,972 times.